Everyone’s tastes and situations are different so no two gardens are ever planted up the same. 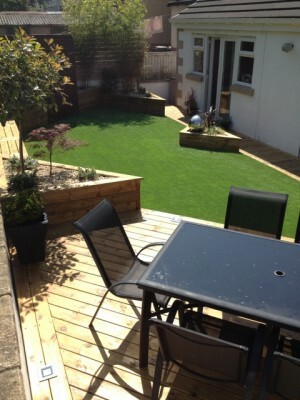 Often customers want a garden to have all year round interest, sometimes it’s just concentrating on the summer months, sometimes it’s simply a case of what looks good and can stand a lot of hammer from a football! There are certain plants that I do use quite often for different reasons, and I thought it would be useful to have a blog with photos of them that can be referred to when discussing planting plans. 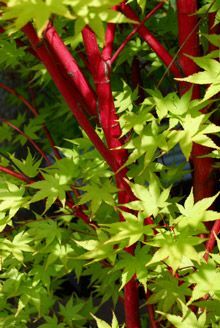 Acers are superb trees for smaller gardens – you can tell it is a favourite of mine as I have an acer leaf on my logo. Often customers are scared of having trees but it is important to get some height in your planting, especially if the tree in question is stunning! For larger trees I think Silver Birches take some beating. Multi-stemmed ones don’t get too big height-wise and the stems on these plants are spectacular. They also have quite a light foliage which will let light through in the summer months. 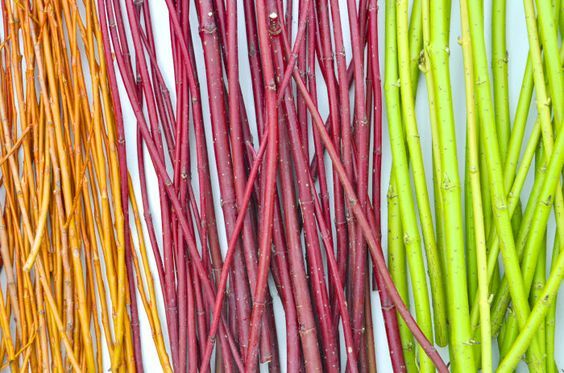 Dogwoods (Cornus) for their colourful winter stems and summer screening. Deutzia – a superb flowering shrub with lovely variegated leaves. Phormium – big spiky plants that look great in a modern looking garden. Don’t be too afraid of the size. There are smaller vatieties – “Yellow wave” is my favourite. Despite looking tropical, these plants, which originate from New Zealand, are hardy. Physocarpus – beautiful dark foliage that contrasts well with lighter yellows and green. There is also a “limey green” version that looks stunning. Choisya. This is perhaps my favourite evergreen. Not only does it look good, it produces a fantastic lemony scent on warm summer evenings, or at any time of year when you rub it’s leaves together. Euonymus – another evergreen which I often use as a bit of a filler. It’s variegated leaves and low, spreading habit are useful for ground cover, cutting out the light for pesky weeds and making it a useful plant for low maintenance gardens. Phyllostachus – bamboo. This is a trendy plant which probably explains why it costs so much even though it grows like wildfire. There are lots of different types of bamboo. 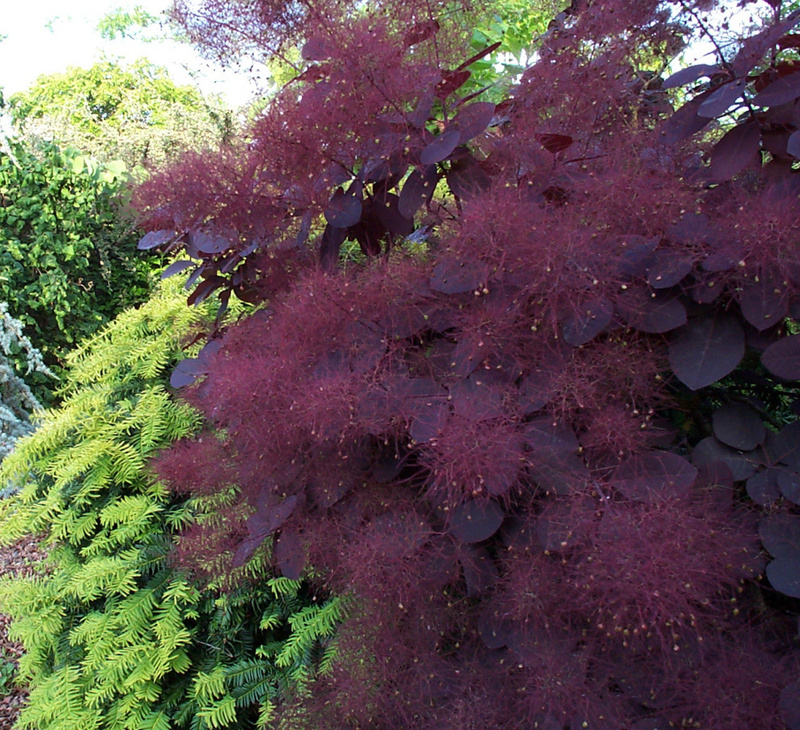 This one is perhaps the best garden variety as it grows in a clump i.e. isn’t invasive and has spectacular black or yellow stems. Although it has been popular for a long time, I still think it looks best in a modern setting. Vinca or perwinkle – perhaps not the most exciting of plants, although it does have a lovely little flower, it is an evergreen that can grow in most places – especially useful for shady spots under bushes etc. There are so many of these plants that do their bit in the good months and die back in the winter, only to re-emerge the following year, that it is hard to select a few to stick on here, but I will have a go. Alchemilla mollis or ladies mantle, I love for ground cover and the way it holds raindrops on it’s leaves. It can get a bit carried away though! Geranium or cranesbill – great ground cover, lovely bright flowers and straightforward to look after. Ferns – lots of different varieties and I love them – the way their leaves emerge and uncurl in the spring is superb and they are another good shady spot plant. Heuchera – these are brilliant semi-evergreen foliage plants that produce a wisp of flowers that seem to hover in the air. Lots of different colours to choose from but my favourites are the purple leafed varieties. Hostas – my wife’s favourite which explains why I have a bit of a collection of them at my house. A lot of people are put off them because slugs love their leaves but I think it is worth giving them a go and protecting them if need be. I tend to do a lot of gardens in newly built homes. Its not really surprising as when people move in, once the house has been furnished and decorated, thoughts turn to the outside. Quite often the gardens of new homes all look the same – a succession of bland rectangles of turf with paling fences and quickly laid “economy” paving patios that are generally too small to serve any purpose. Quite often the building site as it was, is only an inch or two below the surface making planting impossible and that’s even if it’s well drained! It’s surprising how many new gardens tend to be waterlogged. Finally, it’s common for the builders to get a landscape company in to plant up the fronts and communal spaces with boring evergreens that are planted with little thought and half an inch of bark mulch that won’t stop the weeds growing and blows away on a dry day! That’s enough complaining. On a positive note I think new houses nowadays are well designed – more spacious and less like a row of boxes and, quite often, there is a decent amount of garden to play with. From a garden designer’s perspective, new house gardens are like a blank canvass – the only limitations are the fence… and the budget! Most people who contact me tend to want easy-to-look after gardens that serve a function and look good. Gardens for new houses are no different. If anything, it’s easier to accomplish because of what’s not there – such as a 20m high tree that casts a shadow and leaves, or lots of different ground levels. 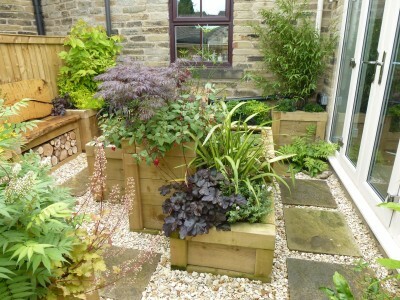 Also, because there tends not to be a lot of decent topsoil, raised beds can be a good solution which look good, are easier to look after and get us round the drainage problems. 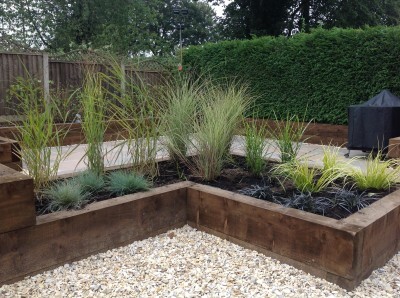 Below are a few photos of gardens I have designed for new homes. If you would like to discuss having a new garden for your home, please give me a call. Really make the most of your space! 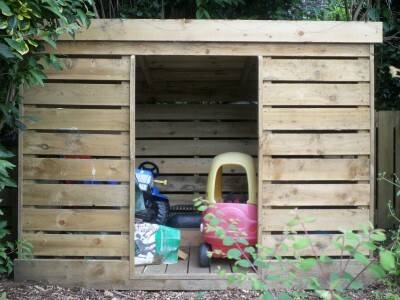 Posted in Gardens by Tim Staves Comments Off on Really make the most of your space! 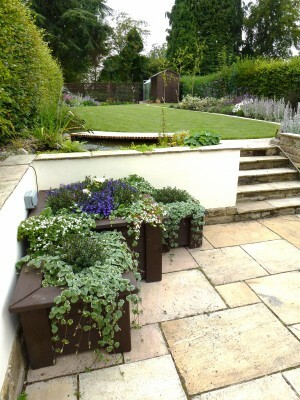 On my website I say I like to build small to medium sized gardens. This is true but if I am asked which gardens give me a real buzz, it has to be “the smaller the better”. Utilising a small space to create something that is good to look at and relaxing to be in, I find to be the most rewarding type of job. 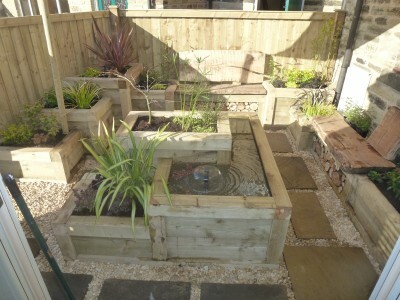 The smallest garden I designed was done 2 or 3 years ago. Roughly speaking, the space is 3 metres by 4 metres which isn’t a lot bigger than an average kitchen. My clients wanted to make the most of this small space which was left after the rest of the garden was taken up by their new conservatory. 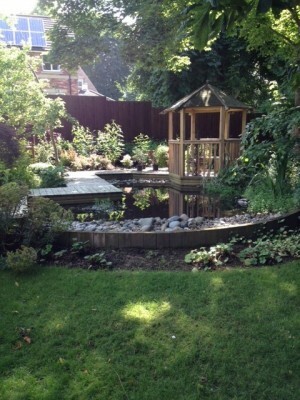 They had seen my website and were drawn to an old case of a garden I had designed and built in Horsforth. The idea in that case, and indeed in their own garden, was to create interest with different levels using fixed planters and striking, specimen plants. 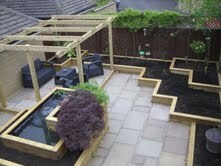 Also using the whole space, including the middle, was a must as this makes the garden feel bigger than it is. I think it is a mistake with 90% of gardens that the middle is not used – how many times do you see lawns with straight borders emphasising the boundaries of an often small plot? To actually stick something in the middle isn’t that easy though and can take a bit of nerve (or at least a good design!). 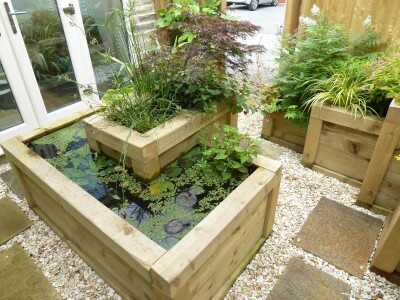 In this case the middle section of planters includes one that has been made into a small pond with a bell shaped fountain – I always think the noise of water adds to the relaxing atmosphere in a garden. 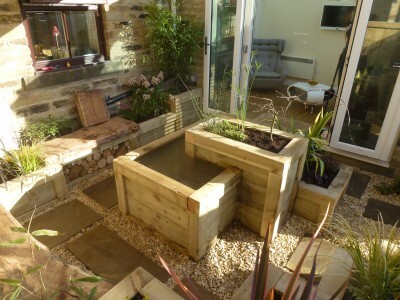 The pond, together with the logs under the seats and the plants in general, make the garden a little oasis for wildlife as well as one for humans. 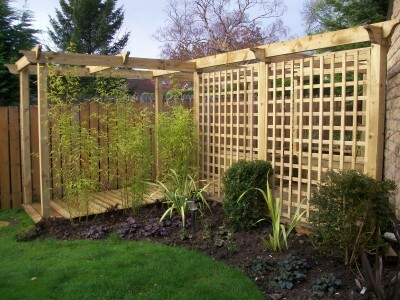 A sun shade, just out of shot in these photos, is a great, cost effective addition to the garden which is a real sun trap. The photos below were taken approximately one year after the garden was finished. 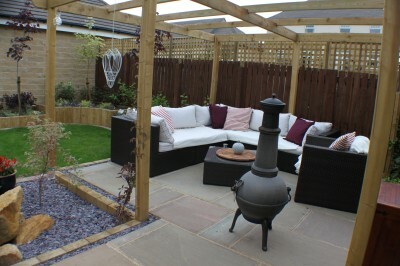 These are pictures of a garden I designed in Wakefield last year. It was built by a local landscaper and then I returned to plant it up. The brief for this garden was to create general interest and entertaining spaces in a garden which had been a simple, open lawn space with a patio that had gone well past it’s best. 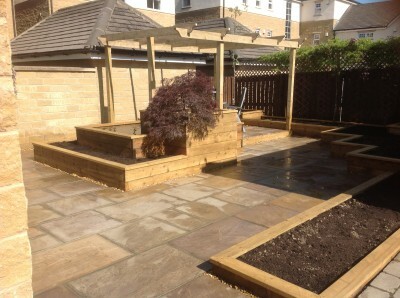 Whilst my clients were not gardeners, they wanted to maintain the garden in the future. By building weed free, raised beds, the garden is easy to maintain by doing a little often i.e. a few minutes a week weeding rather than leaving things to run riot until out of hand. The new garden has a dining space with adjacent outdoor “kitchen” area for the BBQ, and a large outdoor seating area under a pergola. 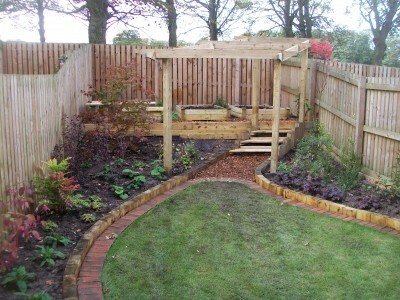 The structures and planting are designed to separate the two main areas and provide interesting walkways and screening. 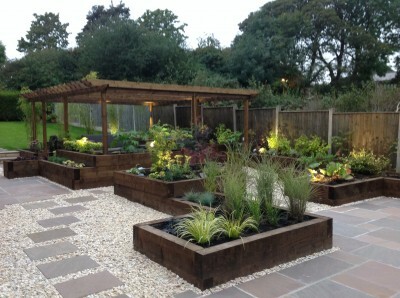 The overall effect is to make the space, which was a decent size in the first place, feel even larger as the corners and sides are obscured by the structures and planting. The only requirement now is time for the plants to grow and some decent weather! 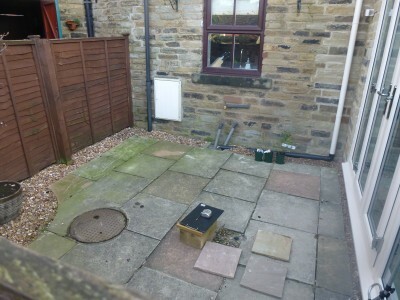 These are pictures of a garden in Rawdon. 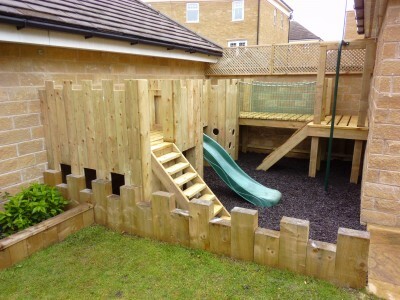 Here the main aim was to provide an outdoor play area for two young toddlers as well as a grown-ups dining area. 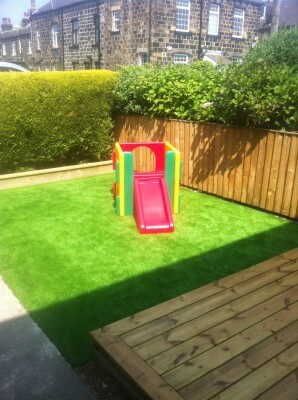 I am not a huge fan of artificial grass in general but as a play surface, it takes some beating. This is especially the case when you compare it to normal turf which is only usable when it is dry and is a real high maintenance feature. 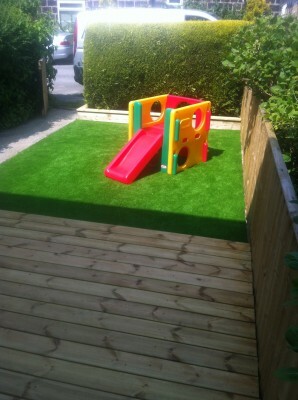 Artificial grass isn’t extortionate but costs more to put in than normal turf. However, you save in the long run if you take into account the hours of grass cutting and the cost of watering, feeding and weeding that you have to do to keep it looking half decent. In this garden the dining area is made from sleek deck boards with chrome solar lighting and there is a spherical water feature and a handy seating area with clever garden storage for all the toys. Posted in Gardens by Tim Staves Comments Off on Duck! I went back to a wildlife garden that I designed a while ago to see how it was evolving. The garden is thriving! 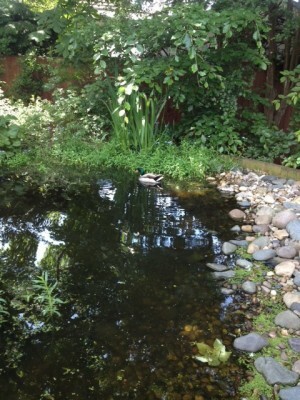 The large pond we created is a magnet for all manner of creatures and just as we were chatting to the proud owner of this garden, two of the newest residents flew in to say hello…a pair of mallard ducks! I would encourage anyone considering a wildlife garden to go right ahead! 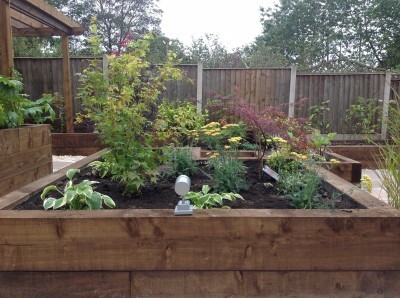 Wildlife gardens are enormously rewarding and hugely beneficial to the wildlife and the greater environment. 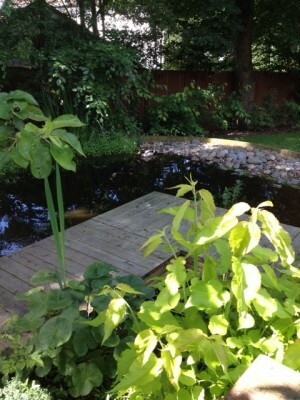 This garden in Adel has a very serene and tranquil feel to it even though it is teaming with life. 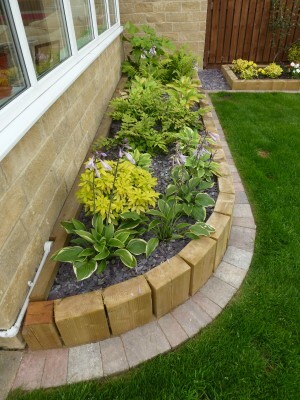 Front gardens should not be overlooked…the possibilities of developing your front garden are endless. Whether you have a small or large front garden and if it gets the sunshine or not, why not think about making it more practical and usable. 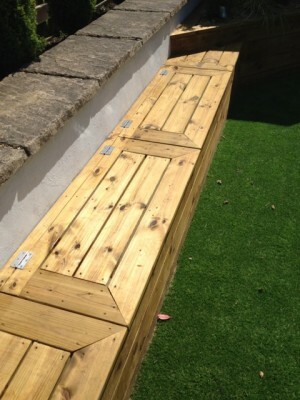 Too often front gardens are ignored as practical spaces because of privacy issues. 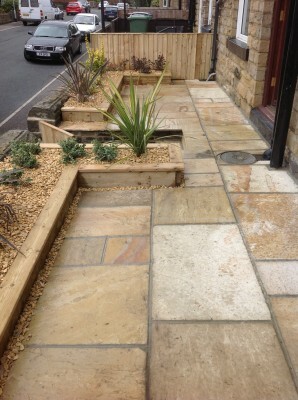 We can design your front garden to make it work for you and overcome any issues with privacy or practicalities. 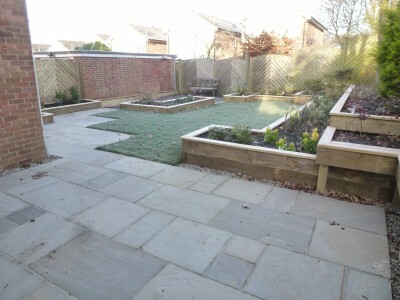 We have recently completed this front garden, which was large enough to have a seating area and a play area. This garden also had a southerly aspect so got the sunshine nearly all day, so it was perfect! 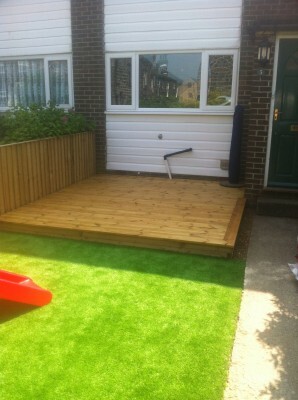 We built a raised deck area for a table and chairs and laid an artificial lawn for the children to have a slide on. The result is a virtually maintenance free garden to be enjoyed all summer long. 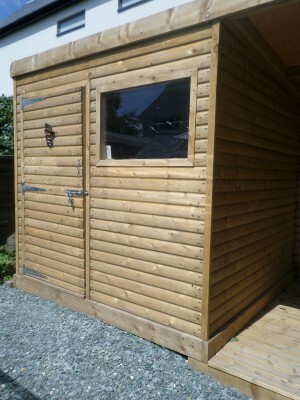 We have created a good few garden buildings now, which are tailored to suit each garden and your specific needs. 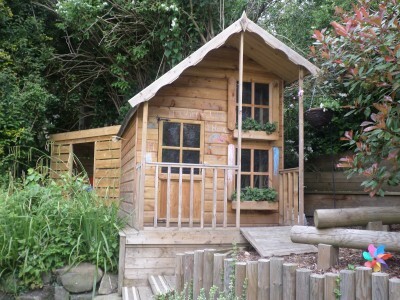 Whether its a potting shed for you, a playhouse for the children, extra storage for gardening equipment and toys, an office so you can work from home and enjoy your garden at the same time or a summer house to relax in, we can design and build to your specific requirements. We offer a better quality option to the ‘flat pack’ products out there, whilst providing a more robust, quality and bespoke product. 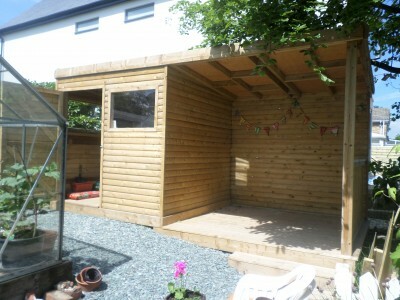 Garden buildings can be designed to fit in with the surroundings to minimise or maximise the visual effects, as desired. We have provided some examples but the possibilities are endless! 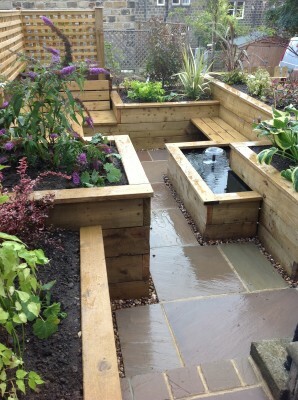 At New Leaf Gardens we are creating more and more bespoke products like these resulting in some truly unique gardens! So go for it and unleash your imagination! 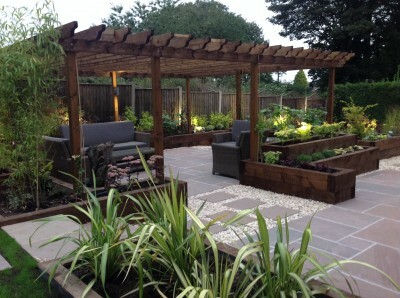 If you would like to discuss the possibilities of your own bespoke garden building then please get in touch. *Garden buildings are classed as permitted developments under building regulations and therefore you can create a lot more space and value to your property with a lot less red tape! 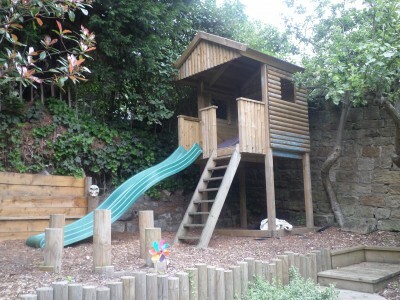 We designed and built this castle climbing frame in a newly landscaped garden using the empty space behind the garage. 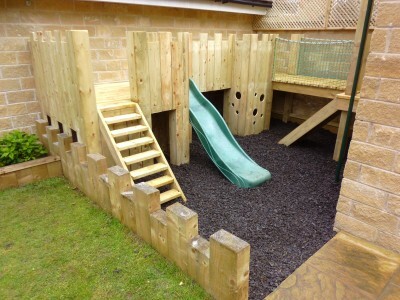 The play area linked in well with the whole garden which has raised beds, lawn and a lovely decked area too. 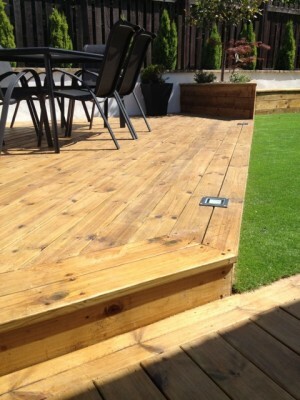 These are photographs of some patios we have installed. They are here primarily to help me show people examples of stone when I call round rather than have me carrying pieces! – they can get quite heavy. This lot are all examples of Indian stone which is basically sandstone although, as you can see, it comes in different colours. Probably the closest to Yorkshire stone is the desert sand but it has to age a bit to look authentic. Why do we use Indian stone? simple answer is price. 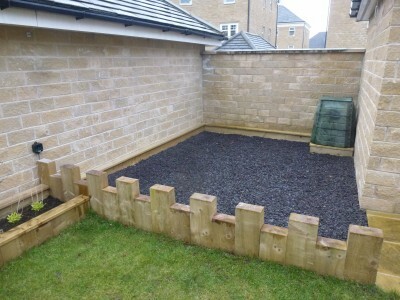 Yorkshire stone is £60-£70 a square yard. 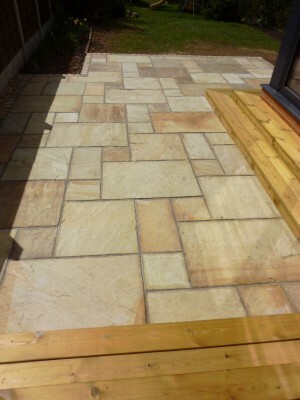 Indian Stone is more like £25 a square metre! As you can see, it also comes in different colours. Indian Stone is often cheaper than man-made flags as well but, at the end of the day, its not all about cost – it has to look right. 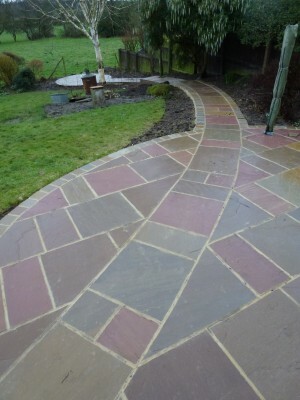 We have done all sorts of patios but Indian Stone probably accounts for 90% of stone ones, hence the inclusion of these photos to save my back!